« Chris Moyles Talks Up Church! The two most important locations in the Christian world stand only six miles apart: Bethlehem the birth place of Jesus Christ and Jerusalem the site of his death and resurrection. 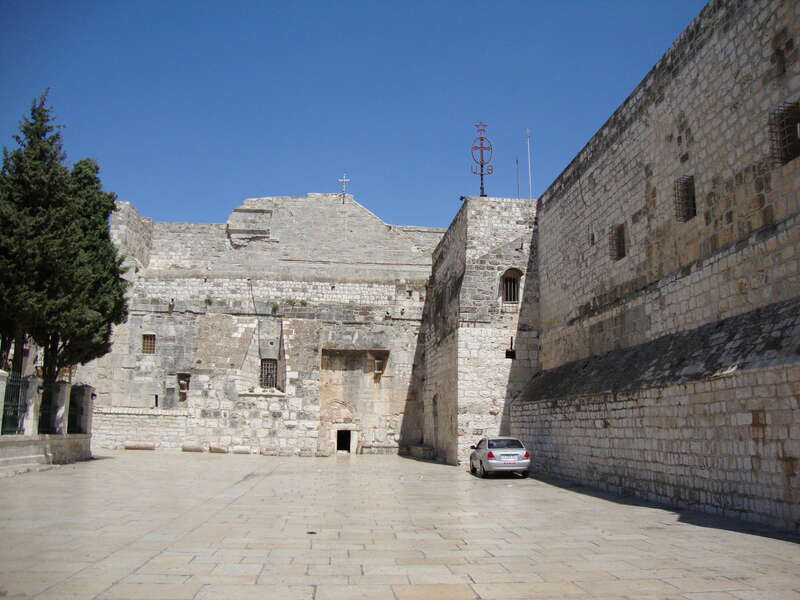 Two churches mark these sites, the Church of the Nativity in Bethlehem and the Church of the Holy Sepulchre in Jerusalem, and for the first time in 2000 years the road between the two is closed. Like Mary and Joseph, travelling from Nazareth to Bethlehem on the orders of the occupying Roman government, Palestinians today live their lives shaped by the Israeli soldiers occupying their towns; guarding the checkpoints and controlling all movement in and out of the area. For those of us who are tourists, the disruption is minimal. For those who live here, it’s a whole different story. Palestinian residents of Bethlehem must get out of their cars; stand in long lines to get their papers checked; they must apply for permits weeks ahead of time, and only for a specific purpose. Even if they are lucky enough to get a permit, they must wait, sometimes hours, every time they leave Bethlehem, and for those who work in Jerusalem there is no fast track; the routine is the same every day. 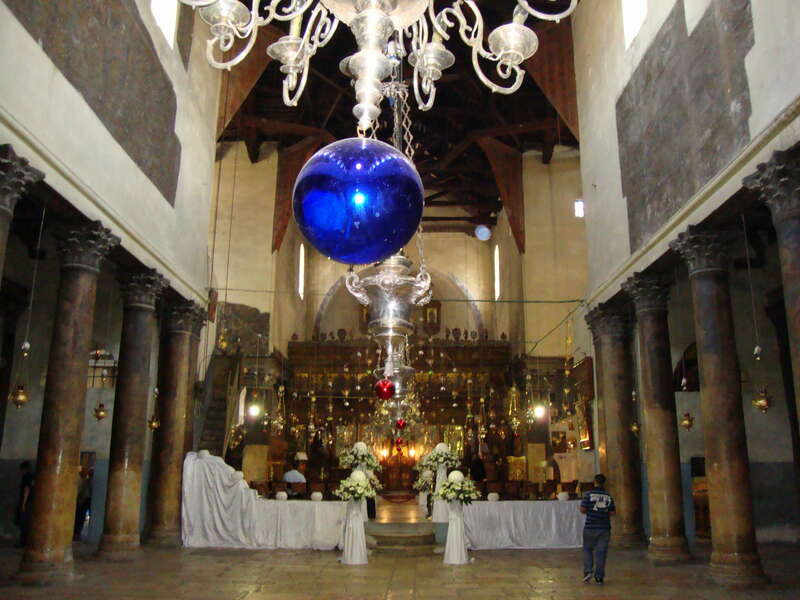 But it was to here that we travelled to see the Church of the Nativity. The Church is built over a cave that is believed to be the birth place of Jesus Christ, this seems to be a very strong, and unchallenged tradition; at the time of Jesus and in the centuries that followed, the oral tradition was very strong and in 135 AD the Roman Emperor Hadrian, perhaps to divert attention from the site, gave orders that a grove, dedicated to the pagan god Adonis, should be planted in the immediate vicinity of the cave. If it was his intention was to deflect attention, what he did was mark the location for the next couple of centuries. 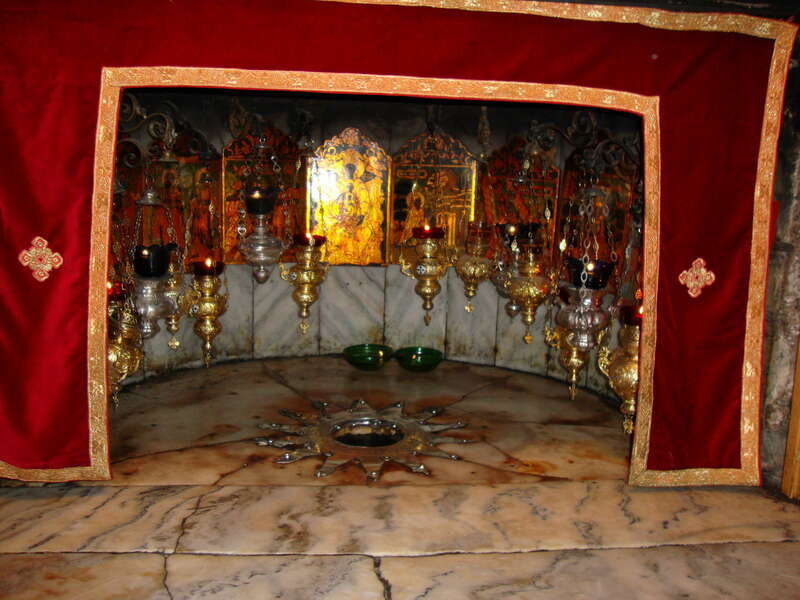 (There are two written references to the Bethlehem cave surrounded by a grove dedicated to Adonis, made by Justin Martyr in 155 AD and Origen confirms it in 215 AD). The church is administered jointly by the Greek Orthodox and Armenian Church, and the interior reflects their traditions. As the case of most other historical sites in Israel, this site too was built, destroyed and rebuilt over the past 1500 years. As you enter the church, you have to bow your head; this is the result of three earlier doorways being filled in. This was done for purely defensive purposes, but for the Christian who enters nowadays, it seems a fitting way to go into the birthplace of Jesus. Once in the church we made our way down some stairs to the Place of the Nativity – a rectangular cave, elaborately decorated with hanging lamps from both the Roman Catholic and Eastern traditions. A silver star on the floor into which you may place your hand, allows you to touch the floor of the cave, smoothed over the centuries by the pilgrims who have come to this place. You leave the cave via another set of stairs which takes you into the area belonging to the Armenians. In this part of the church there is a large open square with an arrays of lamps hanging down the centre; the walls are decaying but the golden mosaics of the 11th century can still be seen; the pillars, largely worn and covered in centuries of smoke and dirt, have delicate paintings on them; underneath the present floor lies the mosaic floors of the 5th century. The whole place gave me a very distinct feeling that I am just a tiny dot in the universe. Suddenly, I discovered that I have unknowingly joined my hands to pray. And as I thought of the Saviour of the world born in this place over 2000 years ago, and who still lives today, I prayed for Bethlehem which at this very moment is in desperate need of salvation.